Disclosure: This post may contain affiliate links. I receive a small commission at no cost to you when you make a purchase using my link. We’ve never released a challenge specifically for this Thanksgiving to New Year’s Day time frame so we’re super excited for this one! We know that this is a very busy time of year so this challenge will not take very much time. While we would like for you to be doing this in addition to your normal workouts (we have quite a few…wink wink) if this is the only thing you have time for it is better than nothing! The goal here is to just get into the habit (or keep the habit) of working out. There are two workout plans that I would suggest for this time of year if you are looking for something more structured. One is our Busy Body 4-Week Workout Plan. You will only spend 3 days a week in the gym (or your home workout space) for 40 minutes or less! Learn more here. Another one is our She Sweats Extreme 4-Week Shred. This one is a little bit more advanced so it is not recommended for beginners. This plan is focused on strength training and HIIT in a circuit-based workout. The four weeks are structured to optimally shed fat and help retain the muscle you have worked so hard to build. Learn more here. 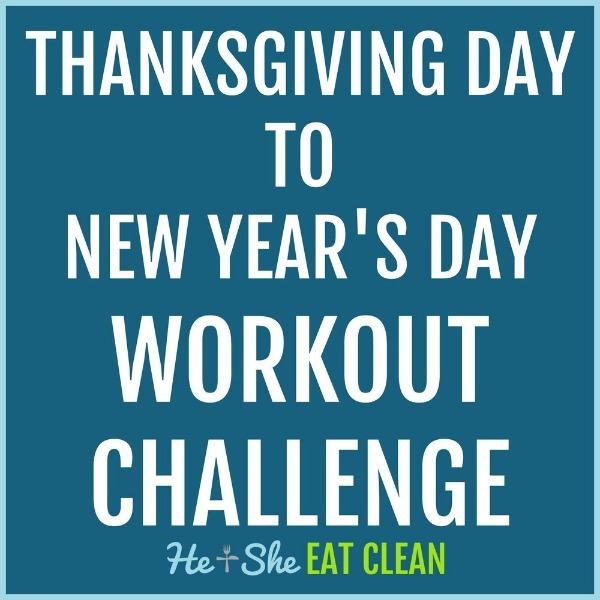 For 40 days, from Thanksgiving Day to New Year’s Day, you have two challenges to do each day. They can even be split up if you prefer. The cardio challenge is just ONE mile of any type of cardio you choose to do. In a perfect world, you would be doing these outside to get the benefit of being in the fresh air and you would be switching things up and doing different types of cardio but I understand that can be hard sometimes. The core challenge is also the same each day, you hold a regular plank, with good form for as long as possible. Not sure how to do a plank? This explains proper plank form. As I mentioned, the goal here is just to get moving or keep moving through the holidays but I’ve also included a “notes” section on each so you can record your mile time and plank time if you would like to try and improve those over the course of the challenge. You could also use this column to check off each day that you complete the challenge! Looking for a printable version of this challenge? We’ve got you covered! Join our newsletter and you will be taken to a black and white printable version right away! Grab the printable challenge here. P.S. Have you heard about our FREE 13 Day Clean Eating Challenge? It includes a sample meal plan, workout plan, plus much more. Learn more and join today! Be sure to check out all of our other challenges here. We have weight lifting, cardio, and core challenges galore! Tag us on Instagram and use the hashtag #heandsheeatclean so we can follow along! Let us be your personal trainers with our detailed 4, 6 and 12-week She Sweats Workout plans! We guide your workout each day, telling you exactly what to do and what intensity to work at. We have everything you need! Find out more! Hi! We're Scott & Whitney. Together we changed our life through clean eating and weight training and now we share our healthy recipes, workouts, and tips and tricks with you! We also take you on our adventures from hiking and backpacking to skiing. Read more here. Signup for weekly recipes and free challenges!